Beijing, Jan.14: Special Representatives of India (M.K.Narayanan) and China (Dai Bingguo) will meet here informally today to review and assess the next steps to ensure a possible resolution of the vexed boundary question. This was disclosed by Narayanan at a dinner hosted for the Indian media by the spokesman of the External Affairs Ministry. It maybe recalled that ahead of Prime Minister Dr. Manmohan Singh's three-day visit to China, Foreign Secretary Shivshankar Menon had said that there would not be a formal discussion on the boundary question, but an informal meeting between Narayanan and Bingguo would be initiated. India and China have reiterated their willingness to find "a fair, reasonable and mutually acceptable solution" to the "boundary question. ", which has been in dispute since the 1962 war between the two countries. The two countries' Special Representatives have so far had eleven meetings on the issue since 2003 both in China and in India. The boundary dispute between India and China involve large areas along their 4,000-kilometre border. India says China is occupying 43,180 sq km of Jammu and Kashmir, including 5,180 sq km ceded to Beijing by Islamabad under the Sino-Pakistan boundary agreement of 1963. 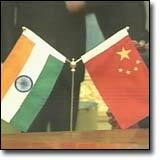 China, in turn, says India is in possession of some 90,000 sq km of Chinese territory, mostly in Arunachal Pradesh.